Navigating a New World Order | HOPE Global Forums | Presented by Operation HOPE, Inc.
21st Century disruption continues to accelerate across all segments of society. We are now fully immersed in the digital age, where results are variable and trends are moving so fast that strategizing becomes a challenge. Organizations and individuals throughout the globe are being confronted with a new set of norms. With foundations constantly shifting, truths once held as certain are being upended on a daily basis. An “Era of Uncertainty” is being fueled by widespread economic disconnect. This is contributing to an overall sense of uneasiness across governments, the economy and our general wellbeing. Societies tend to prosper when the benefits of growth are broadly shared, led by a thriving middle class that embraces the idea of progress. While many economies have continued to experience economic growth, most of their citizens are no better off. Public and private sector organizations are more disconnected from their constituents than ever before. Wages are stagnant, while productivity continues to decline. Jobs and people are migrating to increasingly crowded cities, straining aging infrastructure and driving up costs for housing in markets already in short supply. A majority of young people are living at home, saddled by debt and lack of employment opportunities. Men are increasingly dropping out of the workforce altogether, filling the void with substance abuse and addiction. Mature workers are unable to find wages or work commensurate with their experience. Health care costs continue to skyrocket, as an aging baby boomer population adds to the strain of an overtaxed system. This lack of economic inclusion has led to the rise of a new, “invisible” class. Those left out of economic prosperity, formerly a minority in the U.S, have now become a majority. Economic disconnect is no longer relegated to poor urban or far-flung rural communities. A college graduate making $100,000 a year in New York City is just as likely to be living paycheck to paycheck as a minimum wage worker at a rural superstore. Can the current digital revolution address these challenges? How will we embrace these new economic opportunities and ensure that the majority can participate? How can globalization and technology be harnessed to increase prosperity for all our citizens? How can institutions – government, community, private sector – support the invisible class in navigating this new world order? Last year marked 50 years since the publication of Dr. Martin Luther King’s final book, Where Do We Go From Here: Chaos or Community? In it, he outlined his vision for the future, including the need for better jobs, access to affordable housing and quality education. To that end, Dr. King held a summit in Atlanta on March 14, 1968 that for the first time included leaders from outside the civil rights movement. He asked for their “commitment, capacity and connectedness” to build a credible and powerful campaign of economic inclusion, one that would make “the invisible visible”. Less than three weeks later, Dr. King was assassinated in Memphis. This universal message of hope – that humankind for the first time has the technology and resources to eradicate poverty and end global suffering – continues to resonate today. Creating a stronger and more sustainable economic model, one where rising prosperity benefits everyone, requires leadership not just from government, but the private sector as well. A better future is possible, one that features a free exchange of ideas, uses the next wave of technology to improve society, nurtures innovation and produces growth – not stagnation – with equity. 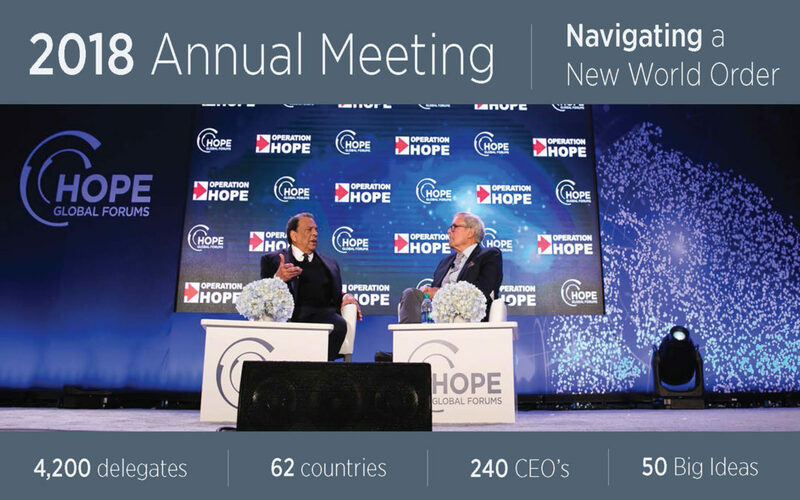 The 2018 HOPE Global Forums | Annual Meeting was held March 26-28 in Atlanta, Georgia, USA. With over 4,200 delegates from 63 countries, it is largest gathering of leaders in the world focused on the empowerment of the poor. Its purpose – to reimagine the global economy so the benefits and opportunities of free enterprise can be extended to everyone.